Looking to get started as a bus or coach operator and don’t know where to start? Well, we are here to guide you and assist wherever possible. The first thing a bus or coach operator must do is apply for a PSV Operator Licence. This is available from VOSA, which is a government department, and the application process can take around 10 weeks. Vehicle insurance. The cost differs, depending on a number of factors including the nature of use (i.e. Private Hire, Stage Use etc), the size of vehicle (particularly pertinent is the number of seats on the vehicle), and who will drive the vehicle. Liability insurance. You need to consider whether you are going to employ other people (in which case Employers’ Liability would be required) and what level of cover is required for Public Liability. Generally speaking clients choose £5 million Public Liability and Employers’ Liability is £10 million. Legal expenses. Most policies include this and this cover gives you access to legal advice and assistance to recover any uninsured losses following a non-fault claim, such as loss of earnings as a result of injury. Breakdown cover. 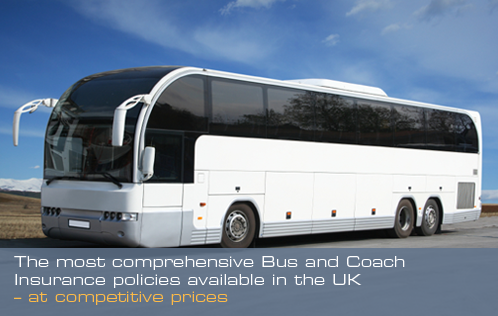 Different types of policies are available such as annual or number of coach days per annum (suitable if the vehicle is used only on a weekend for instance). Excess Protection. Most policies will carry an excess (the amount that has to be paid on a claim). Generally speaking an excess on a coach policy would be around £500. In the event of a fault claim this amount needs to be paid. Having Excess Protection means that your excess can be re-claimed. If you need any advice or assistance please do not hesitate to contact us on 0800 980 3426 or 07875 743 271 and we will be more than happy to help you.